1Energy and Wetlands Research Group, Centre for Ecological Sciences, Indian Institute of Science, Bangalore – 560012, India. A 24 MW hydel power unit (Kukke MHS) is proposed across Kumaradhara near at Kunturu Perabe village Ullipu, Puttur Taluk of Dakshina Kannda district (Figure 6.1). Kumaradhara originates at an elevation of 1480m AMSL and drops down to about 74 m at the dam site. The river travels about 64 km in its course from Madekeri to the dam site. Figure 4 indicats the proposed dam site on the toposheet (48 P/6). 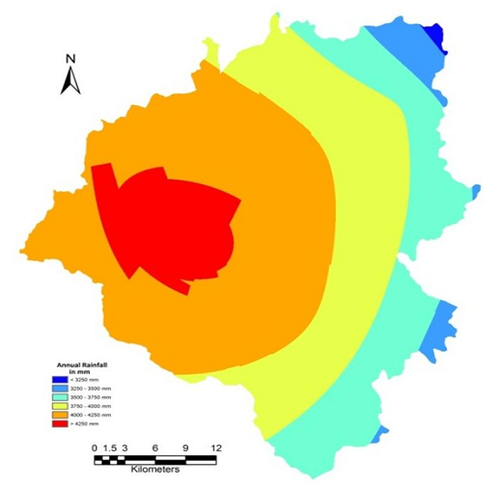 The catchment area is about 1412 sq.km, the rainfall (Figure 6.2) varies from 3100mm to more than 4250 mm resulting in an annual yeild of 5600 Mcum. The proposed barrage / dam across the river is located at 750m downstream of the confluence of Kumaradhara and Gundia River near Koodige Ullippu of Kuttruppady village. The valley is narrow and the abutment has a slope of 1:1 at proposed site. The width of the river bed is about 250 m and the bed level is 64m. The river bed at the proposed site is rocky at places and bedrock is exposed along the upstream and downstream of the barrage. As the project site falls under Precambrian peninsular gneissic terrain, the rocks present are Granite Gneiss and pegmatite bands intruded by basic dykes. The Mini Hydel Scheme (MHS) envisages construction of a power house with an installed capacity of 24 MW. The main components of Kukke MHS as planned are: i) barrage/dam across the River with radial and stoplog gates, ii) coarse trash rack structure adjacent to barrage right side, iii) intake structure on downstream of coarse trash rack structure, iv) powerhouse of 8 generating units of 3 MW each with service bay, control room, etc., v) tailrace pool and open tail race channel including the regarding of riverbed on down streams, and vi) outdoor yard (ODR) of 67m X 94m. Table 1 lists the salient features of the project. Department of Energy, Government of Karnataka has accorded approval (vide EN126 NCE 2011, 38/11/2011) despite the location of the project being in Western Ghats and the implementation of the project entails submersion of forest lands. The chronology of approvals is listed in Table 2. Note: KUKKE stage II project when implemented would affect the current 4.8 MW MHS at Hosmata as the region gets submerged at 83.5 m MSL.Similarly, KUKKE Stage I at 76 m MSL would submerge the generator house and hence MHS at Hosmata would be non-functional due to these projects. Citation: Ramachandra T.V, Subash Chandran M.D, Surya Prakash Shenoy H, Rao G.R., Vinay S, Vishnu Mukri and Sreekanth Naik, 2012. Kumaradhara River Basin, Karnataka Western Ghats: Need for Conservation and Sustainable Use., Sahyadri Conservation Series 24, ENVIS Technical Report : 54, April 2013, Energy & Wetlands Research Group, Centre for Ecological Sciences, Indian Institute of Science, Bangalore 560 012. Indian Institute of Science, Bangalore – 560 012, INDIA.